Now Pasta Is Good for Your Diet? TUESDAY, July 5, 2016 (HealthDay News) -- Pasta may have gotten a bad rap. New research suggests pasta -- specifically noodles in this study -- might actually help you lose weight. 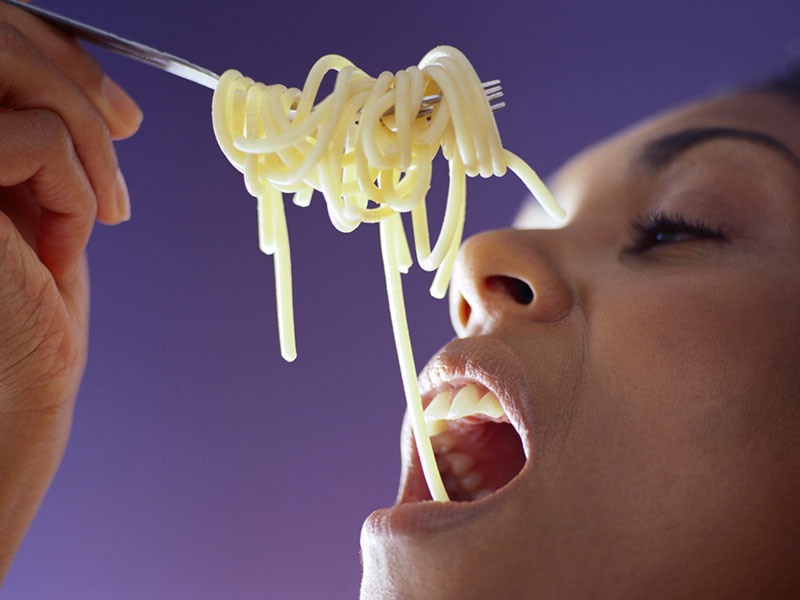 Moderate pasta consumption seems linked to lower chances of general and abdominal obesity, researchers found after analyzing data on thousands of Italians. "Our data show that enjoying pasta according to individuals' needs contributes to a healthy body mass index, lower waist circumference and better waist-hip ratio," said George Pounis, first author of the study. Previous research has touted the heart-healthy benefits of the Mediterranean Diet, which is a way of eating rather than a specific meal plan. It emphasizes fruits, vegetables, grains, beans, peas and olive oil plus fish and poultry. However, little was known about how pasta -- also a staple in the Mediterranean region -- affected health, the researchers behind the new study said. This finding fills that gap, they believe. The results were published online July 4 in the journal Nutrition and Diabetes. "We have seen that consumption of pasta, contrary to what many think, is not associated with an increase in body weight, rather the opposite," Pounis added in a journal news release. Many people have shunned spaghetti, noodles and other types of pasta in recent years because of concerns they were fattening. The new study could potentially cause Americans and others to revise their views. Pounis and his colleagues at IRCCS Neuromed in Pozzilli, Italy, analyzed results of two large studies involving more than 23,000 Italians. One was the Moli-sani Project, which included citizens living in the Molise region -- a little more than halfway down the boot. The other was the Italian Nutrition and Health Survey, which looks at eating habits in all Italian regions. The researchers didn't say how much pasta you can eat without bulking up. Overdoing it, in fact, was linked to added weight. "The obese population was older and at lower socioeconomic status, had higher waist and hip circumferences and waist-to-hip ratio, and consumed more pasta [grams per day] than normal or overweight participants," wrote lead author Licia Iacoviello and colleagues, according to CNN. Still, in light of this research, people trying to lose weight shouldn't rule out pasta, said Iacoviello, head of the molecular and nutritional epidemiology laboratory at Neuromed Institute. "We're talking about a fundamental component of Italian Mediterranean tradition, and there is no reason to do without it," Iacoviello said. The message from this study, Iacovielli added, is that the Mediterranean diet, consumed in moderation and including pasta, "is good to your health."